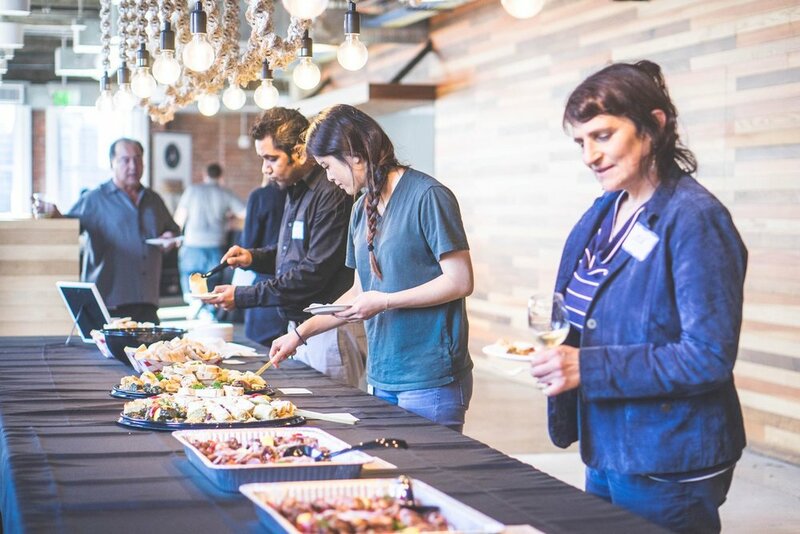 On July 28th, we hosted our second panel at Yelp HQ with Aaron Smith, Associate Director of the Pew Research Center, who lead an eye-opening discussion about the on-demand economy with experts from Postmates , Yelp Eat24 , Shyp , Google Express and BloomThat. Aaron is an expert in the role of the internet connecting Americans to political and civic issues. A native Texan, Aaron received a bachelor’s and master’s in public affairs from the University of Texas in Austin. Prior to her current role, Kristin was Director of Growth at Postmates. Kristin has also worked at PayPal, Clarium Capital and Monitor Group. She has a B.A. in Economics from Dartmouth College, and an MBA from Haas at University of California, Berkeley. A: What is different now from [the past] that has made this round of on-demand economy more successful? K: Technology change, cultural shift: Amazon paved the way by introducing Amazon Prime (2005) two-day shipping. Uber (2009) and Lyft (2012) started to create the mentality of pressing a button for something to arrive in 20 minutes. Smart phones, basically computers, enabled companies and businesses to have a service-to-consumer delivery infrastructure. And, the rising millennial generation now has a mindset oriented towards instant commerce. A: Are restaurants something [Postmates] intentionally cultivated? K: Not initially: The Postmates vision began with a simple idea of enabling a movement of goods around a city. Initial data revealed that early customers tried to hack the courier-system, which showed the need to incorporate food deliveries. From there, we built a payment system behind the platform and the rest was history. A: What does the Postmates workforce look like? K: Very diverse, varies by market: The workforce is made of different backgrounds from students to people in the hospitality industry to entertainment professionals. Los Angeles, for example, is a good place to grow and scale a business like Postmates, because there are many people leading a part-time job lifestyle. Prior to Yelp, Jay was a Senior Associate at Industry Ventures, worked in Corporate Development at Sabre Holdings, and worked in investment banking at Cogent Partners. Jay holds a B.S. in Economics and an A.B. in Public Policy Studies from Duke University. A: What extent is Eat24 integrated into the primary Yelp product? J: Very much integrated in Yelp: Food deliveries from restaurants date back to summer 2013 when Eat24 struck a partnership with Yelp. An ordering button has been added on every Eat24 restaurant since then and after the $134 million acquisition in February 2015, Yelp has made Eat24 more visible in product. A: What’s the sales pitch you make to business owners get them to join Yelp24? J: More orders, large funnel of users: Or, in other words, more revenue for business owners and restaurants. Yelp and Eat24 currently have over 35,000 food locations on the platform that make it easy for new and existing customer exposure. Whether it’s someone looking for a place to eat tonight or doing the usual lunch pick-up, we want to make this a simple process for our consumers. A: What’s the biggest logistical challenge that you face in terms of making your product work seamlessly for users? J: CX support: Yelp invests heavily in its customer support and menu representatives team to ensure customers are getting the best quality of service: right price, add-on options, etc. Food delivery is messy and is constantly changing, but getting it right is something Yelp takes a lot of pride in. A: How do you handle the conflict of interest between biased reviews versus financial interest in Eat24? K: Transparency, minimal conflict: Eat24 applies the same company values of Yelp by upholding a strong company culture of honesty. Yelp protects their review sources, and above all, we put customer experience first. Prior to Shyp, Lauren was an early member of the team at TaskRabbit, where she oversaw 19 U.S. city expansions and led its initial European expansion. In 2015, Forbes named Lauren to its 30 Under 30 list of marketing advertising professionals. A: What solutions have you developed to encourage trust and make your users feel more comfortable? L: 1099 to W2 employee status: The biggest change Shyp made to build trust was its recent conversion of its courier fleet from 1099 (independent contractors) to W2 (full-time employees) in July 2015. From a branding perspective, it has generated an overwhelming response from customers as well as having a profound impact on the business: our NPS (Net Promoter Score) increased from 70 to 85 after the conversion. A: Were there any challenges along the way? L: HR transition time: The transition from 1099 to W2 status took around five months to complete. Aside from a few unforeseen human resources issues, the change resulted in a 99% transition rate. Despite the difficult challenge of moving away from traditional on-demand business models, Shyp ultimately felt it was doing the right thing for our customers and community. Prior to founding BloomThat, Matt worked in the media industry, working for companies like Viacom, Sony Pictures Entertainment, and Zurich Investment Company. Immediately prior to founding BloomThat, Matt served as an Account Executive at Media Arts Lab, an arm of advertising agency Chiat/Day focused on Apple products. A: What makes BloomThat different from established providers? M: New brand, same thoughtfulness: Online flower delivery is not new, same with the idea of thoughtfulness. Everyone is a thoughtful person, but the difference is existing brands and how we want to be thoughtful as a company. When you want to do something for someone, it’s very much an expression of yourself, the product you pick, and the service you choose to use so BloomThat is a new brand for a new generation to be thoughtful. A: How does BloomThat operate behind the scenes and ensure what people order arrives is indeed what arrives at the door? M: Keep it simple: Customers place an order, the order is routed to a local warehouse before a number of couriers to deliver the flowers in just a few hours. BloomThat works directly at the farm level with W2 (full-time) employees, which makes it easier to ensure everything is running smoothly. A: How does BloomThat stand up to established players? What’s the typical use case to convince people to become a customer? M: What you see is what you get: The biggest difference now is social media. Your recipient can post what you send and if it doesn’t look like what you intended to sent, you’ll see it. It was ok before, now it is not. From observing new generation buying behavior, the majority of people are accustomed to transparency and instant gratification. Fixing that allows people to be more thoughtful and find occasions in their everyday life to celebrate. A: How did you discover your unique career trajectory: from production at MTV to starting a flower company? M: Look at the common [life] thread: I grew up drawn to consumer experiences; from amazing restaurant customer service to taking his first Lyft ride in San Francisco. These experiences were inspiration to connect the dots looking backwards and follow something I was passionate about. I didn’t grow up on a farm, but I did follow his passion. Jon currently leads the PM team driving Express’s Operations Systems, Merchant & Advertiser Services, and Core Infrastructure. He studied Economics (and minored in Computer Science) at Stanford University, enjoys outdoor activities, and spending time with family and friends. A: What was the strategic logic behind Google’s entry into the grocery delivery field? J: Organizing the world’s information: The business behind Google Express is to connect the online to the offline world by making merchant inventory: visible, transactional, and deliverable. Today, you can purchase certain products on the web, but there is a whole world of merchant products that weren’t accessible online before until now. We connect users to merchants they love, simplify the shopping experience and give people time back in their lives. A: What is the biggest day-to-day logistical challenge? J: Scalability: It's easy to see a single order managed in the store. It’s when you start considering shipping thousands of packages, how to avoid taking over all the cash registers, etc. that changes how to think about growing your business as the demand grows. A: How is Google Express leveraging its data information? J: Maintaining relationships, making recommendations: This applies to two stakeholders groups: merchants and customers. Express intends to provide merchants with the right information to maintain relationship with its customers. With customers, it’s finding the balance between enabling the customer experience with smarter shopping recommendations while being careful about respecting customer privacy and data security. A: What do you expect the on-demand industry to look like in 10 years? J: New concepts, emerging technology: It’s hard to make predictions, especially about the future. Autonomous vehicles? Robots? Maybe we’ll bring each of these different technologies to life as they start being a reasonable possibility. In the meantime, we’ll leave it to the fortune teller. Thank you to our expert moderator and fabulous five panelists! See all of the photos from the event here.